A noticeable number of new midsize offshore boats and big lake performance boats are running outboards now. Outboards have always been a part of offshore racing but in the 70s they were primarily run on small single engine applications. Before that you would sometimes see multiple straight six mercs on offshore boats under 30 feet but that was rare and they really didn’t have the power and dependability the inboards did at the time. When Mercury broke through with the V6 models in the 70s and evolved their 2.0 and 2.4 engines in the early 80s into more robust engines, there was a larger adoption of outboards for bigger boats. For consumer performance boats though, it was still quite rare as even a mild V8 was more attractive for most recreational performance boaters running in big water on hulls larger than 25 feet. You see quad setups regularly now, back then it was very rare and only in racing, like on this 32 Cary. Fast forward to today and in the last several years we have seen traditional and new offshore boats fitted with the latest big outboards. The benefits are many; more room in the cockpit, ease of maintenance, less cost, efficiency and sometimes improved weight distribution. For everyday boaters who can’t afford most of the boats mentioned below, a great restoration idea can be to remove the old iron V8s and get a bracket to re-power with outboards. Here are some examples of midsize offshore boats and big lake boats that are using the latest outboards to their advantage. Some are classics you’ve seen before, some are brand new hulls designed for outboards. Either, they might inspire to re-power an old rig with outboards. If I missed your favorite boat, let me know in the comments below. 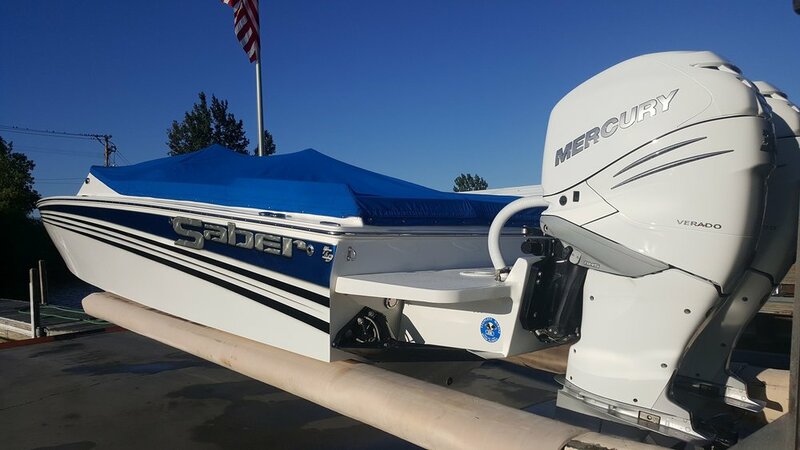 Saber Marine builds their beautiful 28 with outboards. A Stainless Marine bracket allows for an easy installation. Saber's are well built, traditional narrow hull offshore designs. Made in Michigan. Active Thunder has embraced outboards offering 3 models. 2 versions of the 29, the Savage and the Defiant as well as the 33 Express. At 29 feet with an 8.5" beam they should ride really well. Head turning design and competitively priced. Hallett introduced an outboard version of the 290-S. With twin Verados it goes 77 MPH. More of a big lake boat. Not my favorite Hallett design. This is a bit of an anomaly for Checkmate, with a 24 degree deadrise yet with a reasonable 99" beam, the 2800 can double duty offshore or big lakes. Checkmate is a good value performance boat, yet it it is finished with nice hardware and all checkmate boats are fully balsa cored. It looks like a lake boat, mostly because it is the sleekest 28 foot boat I've seen. The hull has 22 degree deadrise, is very narrow, light and runs on a pad. All Tuffs are custom made to order, layup can be full carbon. Stunning boat. One of the fastest 28s around. 98 MPH with twin 300XS. The classic 28 Pantera, narrow and deep. Built to run hard offshore, you see them around Miami and as a custom built boat, there are some outboards. You can find vintage outboard Pantera race boats too. The old i/o versions would convert nicely to OB. If you even have to ask how much money this is, just keep walking bro. Triple 400s, they wanted to put 4 but it is too narrow. This 41 runs around 107 MPH. Good small lake boat! I would say yes. If you're re-powering and you're basically doing a full restoration, go for it. If it is a special or valuable boat, keep it original. There are some great boats out there that just need a little glass work, some paint, a transom bracket and you are good to go. How ridiculous does this look. Mind you the new Cigarette center consoles look like this. Look at that beam! An early 70s Magnum Marine, I believe this is a Cary design? Sometimes offshore boats look better with i/o's. Don't put a bracket on this one. 27 Magnum S.
the tower of power, big back then.